The label on this photo was added by mother, June Lewis. Jacob Wellington Confer Married Frances Marion Forney. Sam Forney was Marion's father, Emma her sister. 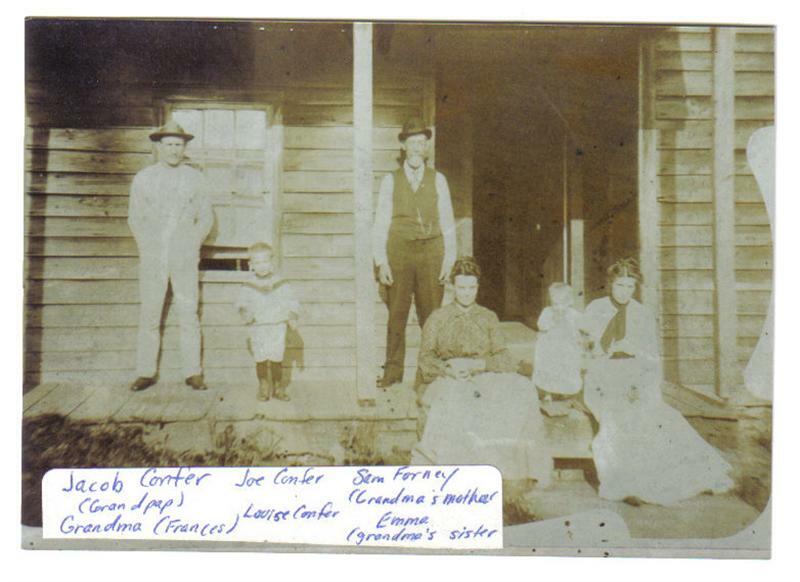 Louise Confer was the daughter of Jacob & Frances (Forney) Confer. The Louise in this photo was born in 1904,so this is probably 1905 or 1906? Making Frances about 26, Sam about 55. My mom labeled this photo.. under Sam's name she wrote "Grandma's mother". I think it's safe to assume she means "father". :-) The "Joe" Confer is actually Ellsworth Raelson Confer born 1907- Joe was his nickname. Also from June (Confer) Lewis - " "Not much but Grandma Confer was Francis Marion (or Marian) Forney. From Danville. Worked at big hotel in Danville by Riverside bridge. Her dad's name was Sam and he died on the toilet in the 1890's. (Oh the things you really didn't need to know) I don't know what her mother's name was, but I'm pretty sure she had a sister Emma." Based on that sparse information, I compiled the census records and possible lineage below. As of yet, I am unsure this is even my correct line, but it's the information I am starting out with. I've placed the census records on the right, and lineage on the left. At the bottom are a few additional links, and contact information if you have any additional information to share. Census records are based on the idea that in the 1880 census, Francis IS a girl, even though it is crossed out and shown on some records now as a son. This could be a faulty assumption, and I could be looking at the wrong line, but this is the first lead of any sort that I have had to follow. William 11, george 8, hannah 4?, samuel R 4 months. Forney, Henry 53 laborer real estate 1000 personal 175 all persons b.